Even with what you have learnt so far, I hope you can see that you can apply science and understanding to the price charts, and increase your chances of correctly deciding which way a price is going to move so that you can place the spread bet in the right direction. 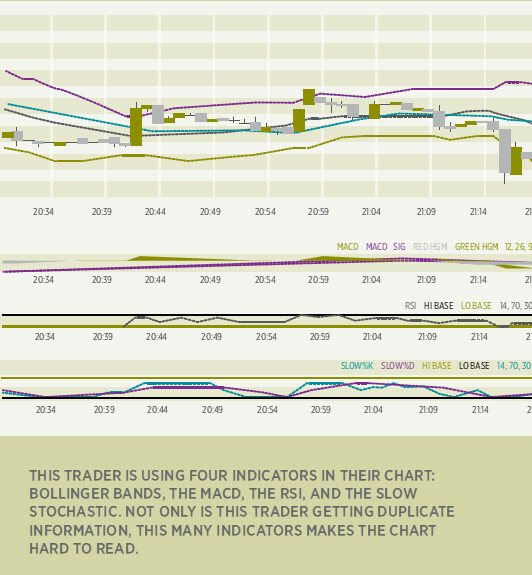 Now we will look at some technical indicators, which are calculated and added to the chart to give further information. 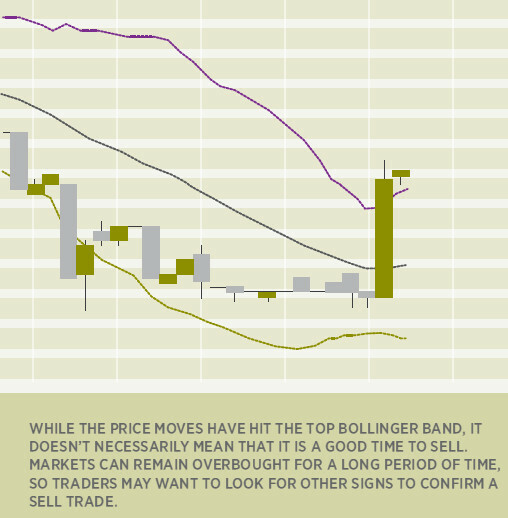 Unlike moving averages, usually the indicators are plotted below the price chart. What’s the market going to do next? This is a question that’s almost always on trader’s minds. Over time, traders have looked at price movements on charts and struggled to make sense of the ups, downs and sometimes sideways movements of a particular market. That’s given rise to technical indicators – a set of tools that use the real-time market moves of an instrument to give traders a sense of what the market will do next. There are 100 or more technical indicators available, with some of them only being invented in recent years, and any reasonable charting program will give you many more than you need to use. In a later section on making a plan, you will see that you only need to use a couple of signals to control your trading. The fact there are so many just gives you a choice. The principles of interpretation are generally similar between many of them, so I will just cover a few here. Many of the indicators are also known as oscillators, and that is because they tend to oscillate between two extremes. These extremes represent times when the market is stretched and unstable, and quite likely to change direction. The extremes are known as overbought and oversold, and they occur when the market has gone too far too fast, overshooting a price balance point, and quite possibly is ready for a “correction”. When the market is called “overbought”, it means that demand has been enthusiastic, and perhaps overeager, pushing the price up to a level which may be unsustainable. The opposite is the oversold condition, when market participants seem to have been rushing to unload their holdings, for whatever reason, and the price may be lower than the true value. Oscillators use a combination of facts and figures to generate these indications. None of them are perfect, some work better than others, and some are better in different types of market. Before you settle on one or two, it will be worth comparing their historic performance on the type of financial security that you are trading, and seeing which gives the best results. Tip: I’m a pretty seasoned trader now and have been around long enough to know what works and what doesn’t. I must have used every indicator under the sun in the past and it wasn’t until I got rid of most of them that I started making consistent money. At the end of the day it’s all about price action, support and resistance and strict money/risk management. It was only through losing money for a few years that I have learnt the discipline required to trade successfully. I’ve learnt to never chase a trade but rather wait for the market to come to me. It took me quite a while to get a system together which works for me – nowadays I tend to restrict the number of technical indicators I use: it’s better to know one indicator than to fry your brain with 20 you aren’t used to. Also don’t go hunting for what you want to find by flipping timeframe and box size. If you set up a trade on the basis of a certain chart with a certain time frame then stick to your trade plan on the basis of that chart. Before you enter your trade work out what criteria would make you sell and be disciplined. Now that you know a little bit about indicators let’s look at some common mistakes that newer traders make when applying them. One of the most common errors that newer traders make when using overbought/oversold oscillators, such as Stochastics or RSI, is to automatically buy oversold or sell overbought markets. What many new traders don’t realise is that prices can remain overbought or oversold for a long period of time in strongly trending markets; indeed, the fact that a certain market is trending implicitly implies that the trade is primarily in only one direction. For this reason, overbought /oversold oscillators are best used in range-bound environments, when there is no clear trend. Another knock against using multiple indicators is that many tools tell traders the same thing (in statistical jargon, this is called multicollinearity). If a currency pair is oversold on the 14-period RSI, it is also likely to be oversold on the Stochastic Oscillator, which cover roughly the same time period. Combining these two indicators is unlikely to give the trader any additional insight and may actually obscure the true state of the market. In general, we encourage traders to focus on only two or three indicators that isolate different aspects of the market and complement each other well. For instance, traders may want to combine an overbought/oversold indicator, a trend indicator, and a momentum indicator to gain a broad-based perspective of the market. Most indicators adjust in real-time to current market prices. On the surface, this sounds very logical. What few traders realise is that this process can lead to false signals when prices reverse within a given time period. For example, a drop in price during the morning may push the daily RSI out of the overbought area (typically, this is defined as above 80) down to 78, prompting a trader to take a short position. If prices reverse and rally to new highs later that day, not only will the trade likely be stopped out, but the RSI may rise back above 80 line, invalidating the reason for taking the trade in the first place. Traders should exercise caution when interpreting indicators before the relevant time period elapses. All modern trading programs allow traders to adjust the default settings of different indicators. This capability allows traders to tailor specific indicators to their chosen time frame and preferences. In all cases, increasing the sensitivity of an indicator (by reducing the time period, for instance) leads to earlier signals, but those signals by definition become less reliable. Conversely, decreasing an indicator’s sensitivity will yield more reliable, but less timely indicators. Each trader must determine the ideal settings for his or her own trading, considering the unavoidable trade off between reliability and timeliness. One of the most important thing to remember when using indicators is that they’re all simply derivatives of price (and/or volume in some markets). Most of the reliable and logical indicators have already been created, and in an attempt to create new indicators, many analysts stray further and further away from price action. Never forget that traders make money by buying assets low and selling them high; all indicators should be interpreted with consideration to what they are implying about underlying price action.